A new “ship-in-a-bottle” approach means less pain, shorter recovery time and lower risk of complications for some invasive surgical procedures. When Ken Baxley was diagnosed with a mitral valve defect last January, he wasn’t sure which frightened him more: the prospect of having his chest opened on the operating table to repair the leaking valve in his heart or the thought of having to limit his activities after surgery. An accomplished pianist and outdoors enthusiast, Baxley wasn’t one to sit still for long. He knew from others who’d had the surgery that healing from it could restrict his activities for months or even a year. But he resigned himself to the fact that the only alternative to living with a potentially fatal heart defect was to endure the painful surgery and prolonged recovery. Until, that is, he learned of Doug Murphy, MD, a cardiac surgeon using a less invasive robotic technology for mitral valve repair and several other types of heart surgery at Saint Joseph’s Hospital in Atlanta. Three months later, Baxley, who traveled from his home state of Florida to see Dr. Murphy, had undergone the surgery and was almost completely recovered. He was back to playing four-hour musical gigs and spending weekends water-skiing with his wife, Jamie. Although Baxley’s quick recovery from heart surgery is far from routine, it’s becoming more common, thanks to a new, less invasive robotic-assisted procedure performed by Dr. Murphy and a growing number of cardiac surgeons around the United States – many of whom Dr. Murphy taught himself. Mitral valve repair is just one of a number of surgeries – including several invasive heart procedures – doctors can now perform with the da Vinci Surgical System, the only FDA-approved robotic surgery device. Other heart surgeries performed with robotic assistance include repairing congenital holes in the upper wall of the heart, removing benign tumors and even performing some bypass surgeries. The conventional approach to these surgeries involves sawing through the breastbone and opening the chest to expose the heart. “Most of the recovery from heart surgery is recovery from the incision.” The new robotic-assisted approach, on the other hand, requires only small incisions between the ribs. “What we are basically doing is going through ribs without disturbing them, sort of like building a ship in a bottle,” Dr. Murphy says. Robotic-assisted surgery using the da Vinci system relies on the same basic elements – the placement of a camera and thin surgical instruments through dime-sized incisions – as the arthroscopic and laparoscopic procedures that have replaced many open joint and abdominal surgeries over the past few decades. Yet robotic assistance brings a new level of precision that enables surgeons to perform operations not previously possible through keyhole incisions. “The typical laparoscopic surgery is done on a television screen, and the surgeon has to look at it and see two dimensions,” says James A. 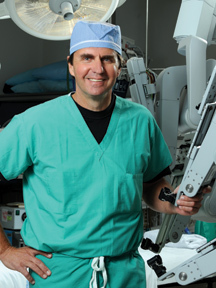 Brown, MD, associate professor and head of urologic oncology at Medical College of Georgia in Augusta, who recently performed the first two robotic-assisted prostectomies at Doctor’s Hospital of Augusta. With experience, he says, most surgeons can adjust to operating with a two-dimensional operating field, but they still have to deal with operating in the confines of the body with tools that allow little range of motion. “Many of these are hinged instruments – it’s like operating with mini scissors or grabbing devices, but you are working through the tubes that limit range of motion,” Dr. Brown says. The robotic device, on the other hand, has wristed instruments, which allow surgeons to move their own hands the way they would in a traditional surgery with precision, but with greater control and range of motion. In addition, the robot’s video monitoring system provides a three-dimensional view of the surgery with magnification 10 times that of the naked eye, allowing surgeons the ability to see the operating field more clearly. Rather than standing over the patient, the surgeon maneuvers the tools from a console several feet away with his face resting on an eyepiece. Where the surgeon would traditionally stand during surgery, an assistant is positioned to suction blood and cut sutures. The benefits of this new ship-in-the-bottle approach to once highly invasive surgeries – ranging from mitral valve repair, like Baxley had, to many urological and gynecological procedures – are numerous. Key benefits include less pain, shorter recovery time and lower risk of complications. Although traditional laparoscopic surgery remains a highly effective option for many abdominal surgeries – such as cholecystectomy (removal of the gallbladder) – robotic-assisted surgery offers the greatest benefit for procedures where “very meticulous dissection needs to take place in deep or hard areas to reach, like the prostate and in areas where reconstruction is necessary – things need to be sewn back together, which is part of prostate removal – the bladder needs to be sewn back to the urethra,” Dr. Brown says. In gynecology, surgeons, in-cluding Joseph Stubbs III, MD, at St. Joseph’s/Candler in Savannah, are using robotic technology increas-ingly for surgery to correct vaginal wall prolapse (weakening of vaginal tissues that normally support abdominal organs) and hysterectomies. As with heart surgery, the main benefit of the new technologies is the ability to avoid a large incision. In addition to sparing patients a large incision to open the body, robotic-assisted surgery also minimizes trauma to internal organs – both the organ the surgeon is operating on and others that must be moved to access that organ. “The instruments are so small that you are doing millimeter by millimeter dissection and so you are really very meticulous with high precision, going exactly where you need to go,” Dr. Stubbs says. In certain heart surgeries, robotic technique offers more than reduced pain and recovery time and a lower risk of complications – it offers superior results to what a surgeon can achieve through an open surgery. “You can sort the categories of the quality of surgery we do with the robot into two levels,” Dr. Murphy says. On one level are surgeries that can be done well with an open procedure, he says. For example, both open surgery and robotic-assisted surgery are very effective for repairing holes in the inner wall of the heart or removing tumors from the heart. The advantage of using robotic-assisted surgery in these procedures is avoiding the large incision. The other level is surgeries that can be performed better with a robotic-assisted procedure. In the case of the mitral valve, surgeons are substantially better at repairing the valve with the robotic procedure than with an open surgery, Dr. Murphy says. The goal for mitral valve surgery is to repair the valve, not replace it with an artificial one – which carries a higher risk of infection and other complications and necessitates a lifetime of blood-thinning medications. Surgical robots were originally designed for the military. The hope was that they would allow a doctor in a safe place – even another country – to perform surgery on the battlefield. “But it turned out that the delicateness of the robot wouldn’t lend itself to being out in the deserts of Iraq or the Sudan,” Dr. Stubbs says. It also turned out that robotic technology could play a crucial role in surgeries performed in traditional operating rooms. In 2000, the FDA approved the da Vinci Surgical System by Intuitive Surgical Inc., making it the first robotic system to be used in American operating rooms. By 2001, a handful of U.S. hospitals had it. Saint Joseph’s joined that small number in 2002, becoming the first hospital in Georgia to use the technology. “We were actually involved in the research trials to prove the robot was safe, and that gave us a huge jump on it,” Dr. Murphy says. Today, Saint Joseph’s has three robotic systems, and Dr. Murphy’s practice has performed more than 750 robotic heart surgeries. “It’s pretty much routine,” he says. He predicts this will be particularly true of the baby boomers, who will require surgery for some of the problems – heart problems, prostate cancer, vaginal prolapse – for which robotic surgery has proven most beneficial. While robotic surgery won’t – and can’t – ever completely replace open surgeries, Dr. Murphy wants to ensure that as many people as possible benefit from the new technology. Some estimate that as many as 2,500 heart surgery candidates in Georgia each year could have their surgery performed via robotic surgery rather than open surgery, sparing themselves the pain and long recovery period. Dr. Murphy’s goal is to make the surgery possible for more people everywhere by training additional surgeons both in Georgia and around the United States to perform the surgery. Dr. Stubbs believes it’s important that people who could benefit from robotic-assisted surgery have the opportunity. “We need to get the word out there to let patients know about this type of surgery,” he says. As Ken Baxley spent his summer skiing on the lake, he was grateful he got the word about robotic surgery. Otherwise, he’d probably have been sitting on the shore this summer.